Today’s post is two photos because I’m too worn out from shopping to write a proper one. This is one of the mugs in my house in highgate. 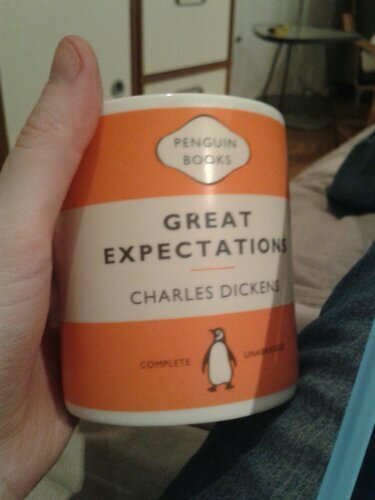 I think it’s really cool – there are a bunch of different penguin classics in mug form. If I ever find wuthering heights I’ll have to buy it and keep it forever as my mug to give Dave when he comes to visit. 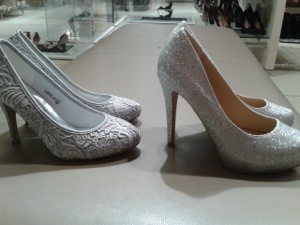 And these are the shoes I’ve narrowed down my wedding shoe search to! It has taken me forever to find a pair of silver shoes with closed heels and toes – there was any number of silver peeptoes and silver strappy sandals, but I didn’t want any of them – I’m fussy, you see. So today I traipsed the length and breadth of Oxford Street until I found these two pairs in BHS. I’m currently mulling over which of them I want – I really like the sparkly pair, but I’m afraid buying them will mean that anything which comes back to Ireland with me at the end of the month will be permanently tainted by glitter. The other pair are more comfortable, too, which I think is important when they’re for a wedding – I’ll be wearing them from three in the afternoon until the wee small hours, so comfort is probably important! I dunno, I’ve asked the Internet for opinions, but they can’t make up their mind either – different people have given different pointers.